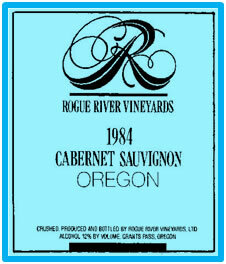 Rogue River Vineyards started in 1984 as a venture among four California families. They purchased five acres near Grants Pass, built a winery, planted a four acre vineyard, and moved to the property in 1986-87. Bill Jiron was the winemaker. Premium wines and high end “coolers” were sold under the Rogue River Vineyards label. The Silver Springs label was lower priced table wine made from California grape juice. In the mid-1990’s the winery dropped many of its products and produced premium Chardonnay. The winery’s address was 3145 Helms Road, Grants Pass, OR. Wine made under the “Lumiere” & “Heritage” second labels was California white wine trucked to Oregon, with fruit flavors added. These wines had varying degrees of success!